If you or a loved one is awash in credit card debt, the situation might look hopeless. After all, you may be staring at thousands of dollars worth of credit card bills with no real idea about how to eliminate that debt. Some people simply try to pay off high interest rate debt first. But frankly, that strategy isn’t as effective or as desirable as you might think. Read why you should not focus on high rate debt first. But even if you do have a game plan, you might find yourself mired in debt month after month or year after year, with those credit card debts barely budging. No matter whether you want to eliminate your debt this year or over a few years, here are three tips to get out of credit card debt sooner rather than later. When you’re trying to eliminate debt, no matter how much you may have slashed your household expenses or cut out frivolous spending, it might all be for nothing if you have no savings. People without any savings at all are far more likely to fall into debt, or get back into debt if they’ve previously wiped out credit card bills. That’s because unforeseen circumstances happen to all of us. And if you don’t have any cash set aside, you’ll be forced to put unexpected expenses on a credit card. Imagine for a moment that you finally become debt-free, but then your car gets a flat tire, or your bathroom pipes springs a leak and you have to call a plumber. With a little cash as an emergency fund, you could readily handle these problems and it’s not that big of a deal. But without any savings to pay these costs, anytime you encounter any setback (large or small) you’re right back to square one: using your credit cards yet again without being able to pay the balance in full. To avoid this problem, start working on building savings into your budget now. If you’ve tried and failed at budgeting in the past, read these 6 Secrets to Creating a Budget You Can Live With. 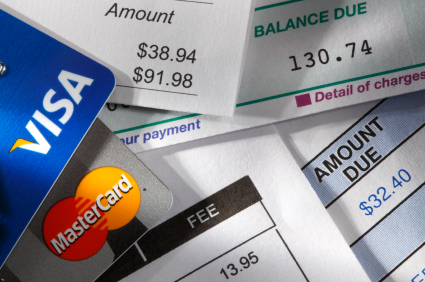 You’ve probably heard personal finance experts say that you should try to only charge on your credit cards what you can pay off each month. That’s good advice, of course. But what about if you already have a boatload of credit card bills that you’ve not been able to knock out? You have to follow some different rules. And really, no one is better suited than you are to create those rules and ultimately live with them. So how to you develop a customized, personal set of rules about credit card use? You do it by attacking your weak spots. Think through your own weaknesses – you know what they are – and be honest with yourself about what problem areas have gotten you into debt. If you know part of your debt problem is that you’re a sucker for jewelry, handbags, shoes or perfumes, then avoid constantly going into stores or the sections of stores selling those items. Likewise, if you know you can’t say “No” to your kids when you’re out at the mall, or even the grocery story, why not leave your children at home (supervised, of course!) and then you can shop without adding extra costs to your final bill. Or maybe your debt is because you’ve had one of the “Dreaded Ds:” a downsizing, divorce, death in the family, disability or disease. Whatever the case, your personal rule might be something like: I will not put more (fill in the blank with “clothes,” “toys,” “legal expenses,” “medical bills” or whatever) on my credit cards because I want to be debt free. In reality, you don’t have to go it alone to get out and debt. And often, it’s way better if you didn’t try do handle things on your own. Certainly if you’ve already attempted to negotiate with creditors or pay down bills by yourself, and you’ve gotten nowhere, it’s time to seek professional help. A good debt management company or a credit counseling firm can help you consolidate your debts, lower your interest rates and work out a realistic repayment plan with your creditors. As someone who once had $100,000 in credit card debt and successfully paid it off, I can tell you unequivocally that there’s no shame in having made mistakes in the past or in getting help. On the contrary, it’s far worse to suffer in silence when you have good debt relief options available to you from experts who know how.